BJP leaders and workers staged protests across Delhi on Monday, demanding the arrest of an AAP MLA for allegedly threatening to party president Manoj Tiwari during the inauguration of Signature Bridge, and waved black flags at Delhi Chief Minister Arvind Kejriwal in Nand Nagri. "Hooliganism by the Aam Aadmi Party on the occasion of inauguration of Signature Bridge was seen by people of Delhi. 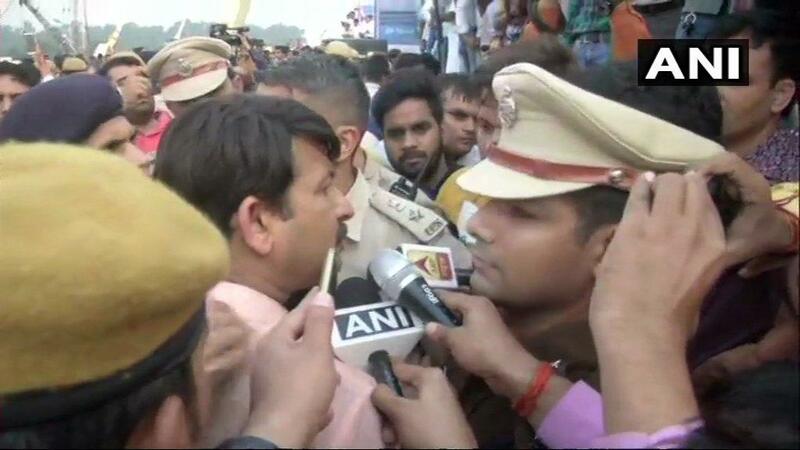 The president of Delhi BJP, Manoj Tiwari, was attacked and abused by MLA Amanatullah Khan due to which all the party workers are agitated," said BJP's general secretary Rajesh Bhatia. He said scores of party workers were detained by the police during a protest near kerjriwal's residence and taken to the Delhi Police operation cell's office in Maurice Nagar from where they were later released. Another group of BJP leaders and protesters staged a gherao of Amanatullah Khan's residence in Jamia Nagar under the leadership of senior party leader Rambeer Bidhuri. "Amanatullah is an anarchist MLA of AAP. His threat to Delhi BJP president Manoj Tiwari and pushing him down warrant his arrest. We will stage daily protest at his house, if the police fail to arrest him soon," Bidhuri said during the protest.